Two artforms, alike in their lengthy traditions and explorations of familial and martial subjects but divergent in their aesthetic, are brought together by their areas of commonality. Wu Hsing-kuo (Contemporary Legend Theatre) adapts aspects of Shakespeare’s tragedy in the style of Jingju (Peking Opera) with an attempted postmodern spin in his one-man show. Wu draws on the polyphony of artforms inherent in Jingju -- song, spoken word and movement -- to render King Lear and a host of other characters. Split into three acts, the first covers Lear’s anguish at the treatment he suffers at the hands of his daughters. Under riotously-coloured lights, dwarfed by an imposing set, accompanied by offstage traditional musicians he utilises comic exaggeration combined with a taut physicality to depict the inner turmoil of the king, to profound effect. Briefly, Wu steps out of character to introduce the idea of ‘looking for Lear’ and questioning where he resides. For the second act he sheds the skin of Lear to inhabit most of the rest of the cast. Mining many for their comic effect, there is a vast shift in tone. Where before the comic antics of Lear enforced his plight, here his depiction of his daughters seems only to exist to allow Wu’s parody of female coquettishness. He again shifts, this time into the simultaneous roles of Edgar (feigning madness) leading his blinded father, the Earl of Gloucester, to his death. This plotline is artfully depicted and changes substantially from the source text to feed into the earlier idea of searching and not necessarily finding. Hu’s recognition of the similarities of both Shakespeare’s and Jingju’s stock comic characters and their similarity in capturing the scope of towering individuals works well to bridge the two forms of theatre. 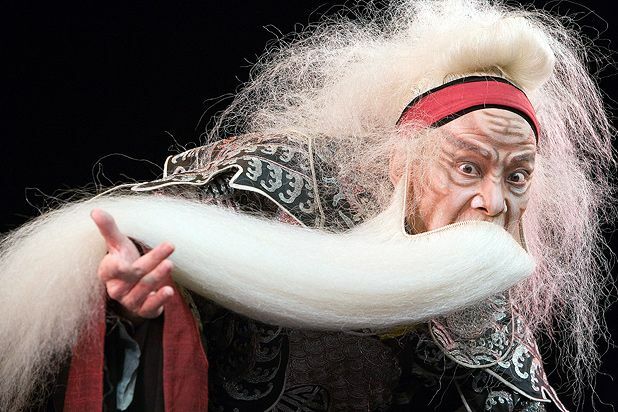 By adding key traits of Jingju – the Chinese music, flamboyant costuming and acrobatics – to King Lear, he creates an exciting take on an old text. Focusing on picking out one thread, amplifying and distorting it with Peking Opera techniques creates an interesting dissonance where imagined expectations of Shakespeare are thrown into question by the inclusion of tropes of Jingju as unfamiliar elements: the clattering, chiming soundtrack; the exquisite hand gestures married to athletic combat; the lush ornamentation of the costumes. The final act is more of a coda, harking back to the text and providing closure for the character of Lear. Earlier hints at Wu stepping back from the characters and inserting himself in proceedings frustratingly do not manifest clearly. But, an engaging spectacle, this reading of King Lear offers a new addition to two theatrical traditions, enriching them both. Royal Lyceum Theatre, 473 2000, until 16 Aug, 8pm, £10-£30. A one-man version of Shakespeare's tragedy of power, deceit and biting loneliness, written, directed and performed by Wu Hsing-Kuo with an array of richly detailed costumes, live music, song, martial arts, contemporary dance and sheer stagecraft. Part of Edinburgh International Festival.